The Cathedral of Saint John the Evangelist, originally called l'Église St-Jean du Vermilion, is a historic Roman Catholic cathedral. It was the first church in Lafayette Parish. 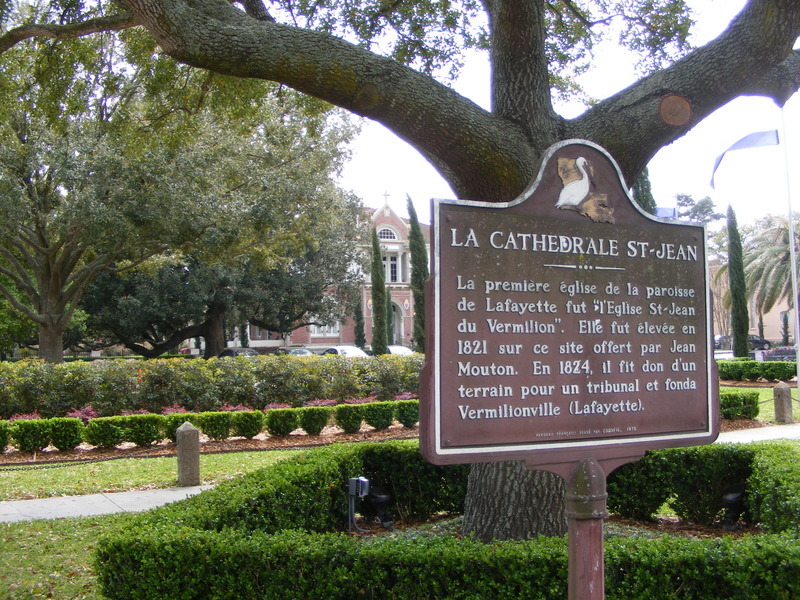 The land was donated on December 30, 1821 by Vermilionville founder Jean Mouton as he partitioned the area in Lots to create the town known today as Lafayette. Construction of the church in its current form, with its Dutch Romanesque Revival style, was started in 1913 and completed in 1916 by Eugène Guillot, a contractor from New Iberia. Two other churches had stood on this lot before the current one. 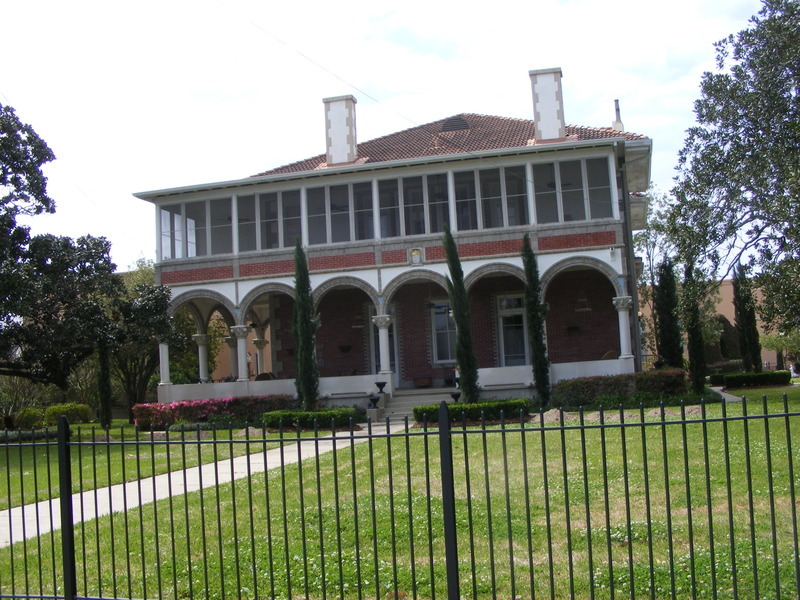 The first one had served as a camp for the Federal troops during the Civil War burnt down and the second one was destroyed after a Hurricane in 1899. They were replaced by this grand Cathedral which became the Bishop’s see of the Diocese of Lafayette. Quite a change from the original small wooden church! 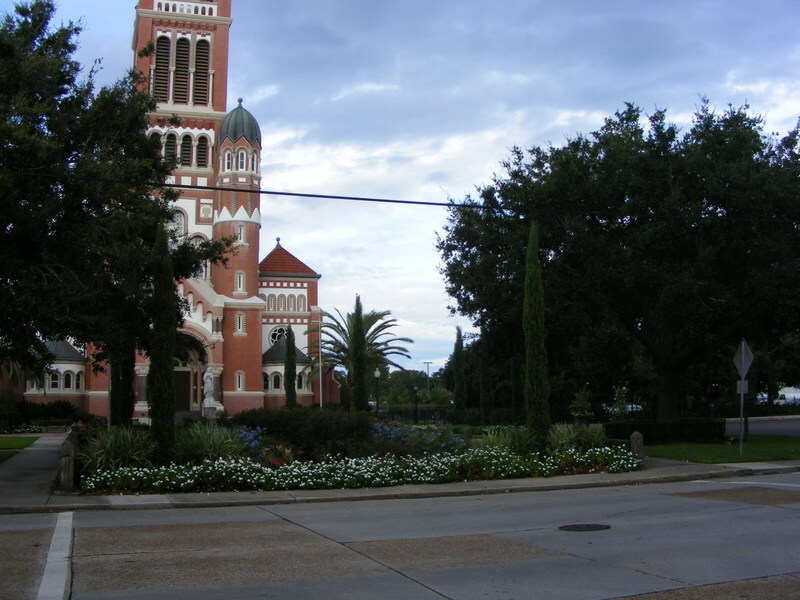 To the left of the church is the Diocese Museum where they will be glad to offer you more information on the design and architecture of St John the Evangelist and the history of the Catholic faith in Southwestern Louisiana. 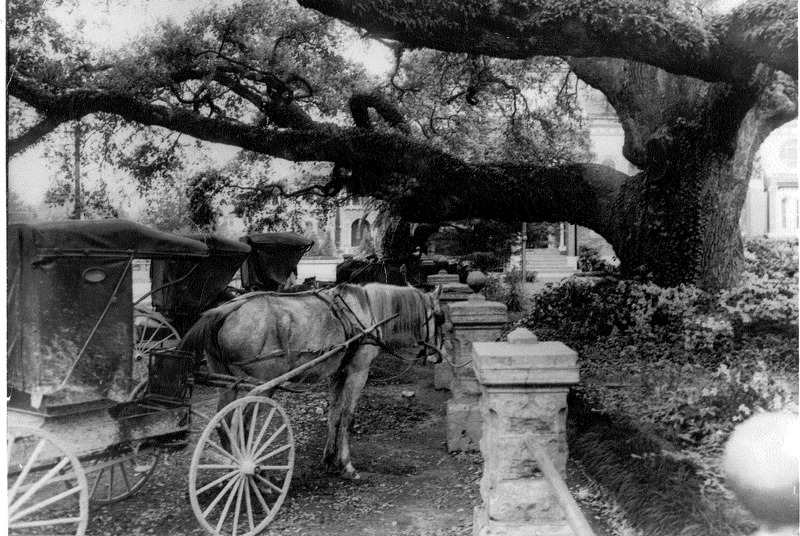 “Le Grand Chêne Vert” or the Saint John Live Oak is one of the oldest members and Vice President of the Live Oak Society founded in 1934 to recognize and preserve these wonderful monuments of Nature that shades throughout Acadiana. Arborists estimate this live oak to be more than 500 years which makes it much older than the Sate or even the Colony of Louisiana which was founded in 1699. Nine feet in diameter and twenty nine feet in circumference, the Saint John Live Oak stands at one hundred and twenty six feet high with a span of one hundred and forty eight feet. This mastodon could weigh as much as 72 tons. You are invited to visit the museum for a small fee. The curator, Ms. MacNeil, will be happy to answer any questions. You can also ask inside for a tour of the Cathedral Cemetery. As the first cemetery in Lafayette, this Catholic Burial Ground is the final resting place for the founding families and some veterans from all eras beginning with the Revolutionary War up to today. The first graves are from the 1820s. The tomb of Vermilionville founder Jean Mouton is located in the first row behind the Cathedral.